We are thrilled to host a live recording of Person, Place, Thing, a public radio show by Emmy Award-winning writer Randy Cohen, widely known as the “The Ethicist” of NYT Magazine, and featuring Pulitzer Prize-winning poet Tracy K. Smith. Person, Place, Thing has a simple premise: Randy interviews guests about one person, place, and thing they find meaningful. The result? Surprising stories from great talkers. Join us for a special evening of live music and lively exchange. Readings by Sherman Alexie, Tina Chang, Toi Derricotte, Michael Dickman, Timothy Donnelly, Cornelius Eady, Thomas Sayers Ellis, Nick Flynn, Rachel Eliza Griffiths, Marie Howe, Dante Micheaux, Sharon Olds and Tracy K. Smith, with musical interludes by mezzo-soprano Alicia Hall Moran. 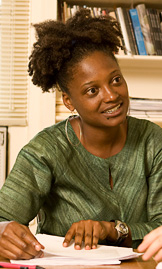 Tracy K. Smith is currently considered a "single author." If one or more works are by a distinct, homonymous authors, go ahead and split the author. Tracy K. Smith is composed of 1 name.